Baltimore will shine bright this week during Light City, a large-scale celebration of lights and innovation featuring jaw-dropping displays and special events. The first large-scale light festival of its kind in the U.S., Light City Baltimore is running now through Sunday, featuring 29 light art exhibits along Baltimore's scenic waterfront, as well as delicious food options, innovation conferences, and dozens of concerts and performances. Some of the week's events include Light City Cruises on the Bay (Friday-Saturday), a light-themed scavenger hunt at the National Aquarium (through Saturday) and a Family Glow Party at the Port Discovery Museum (also Saturday). See the full schedule of Light City events, times and locations online here. During daylight hours, four conferences will center on the question: How do we become a more responsible and equitable society? Industries represented in the conferences include health, sustainability and more. See all conference info here. 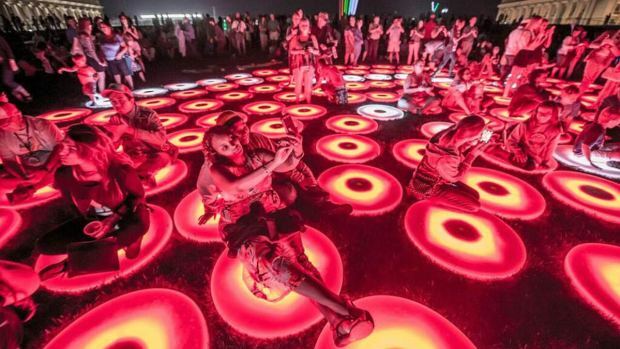 At night, music groups such as local 9 Mile Roots and performers such as the Theatre of Fire will take over the scene, among the illuminated exhibits. For younger festival-goers, the Bright Lights Youth Festival will take place at the IMET Columbus Center on Friday and Saturday. The schedule of events includes a youth debate, rap battles and more. Families can also visit Mini Kiddie Light City in Pierce's Park on the Baltimore waterfront, nightly from 7 p.m. to 9 p.m., and until 10 p.m. Saturday. Find interactive crafts, kid-friendly entertainment and unique snacks such as lighted cotton candy. As if free entertainment and beautiful exhibits aren't not enough, local restaurants, bars, tourist attractions and stores will have special deals and discounts during the festival. You won't want to miss the Light City Sunset Specials at Aggio or two rides for $5 on the scenic Harbor Carousel.